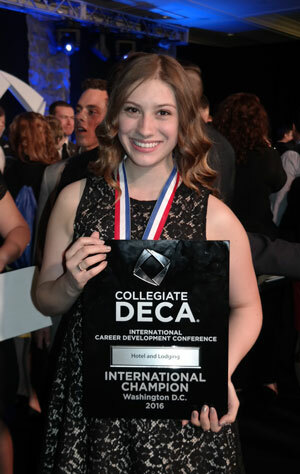 Southern Utah University freshman Lindsay Joyner has been crowned international champion in the Hotel and Lodging category of competition that pitted some 700 students at DECA’s recent International Career Development Conference in Washington, D.C.
DECA, or Distributive Education Clubs of America, is an international organization that prepares emerging leaders and entrepreneurs for careers in marketing, finance, hospitality and management in high schools and colleges around the globe. The DECA competition presents students with a simulation, case-study or professional presentation in 24 different business categories. Depending on the event, students have 20 to 60 minutes to prepare and present before the judges who score the students on problem-solving capabilities. Joyner demonstrated impressive critical and analytical thinking, problem solving skills and professionalism, according to judges. Highly involved with the high school chapter of DECA in her hometown of Birmingham, Ala., Joyner sought out SUU’s collegiate chapter upon her arrival to campus in the fall of 2015. This business major is driven to succeed and has set high goals for her future education and career. Brandon Armstrong, career coach and employment outreach coordinator, helps prepare students associated with the SUU chapter of DECA each year for the conferences and competitions. Armstrong sees the program as a great opportunity to practice on-the-spot thinking and troubleshooting. DECA is a nonprofit student organization that specializes in marketing, finance, hospitality and management with more than 200,000 members across the U.S. and several other countries around the world.